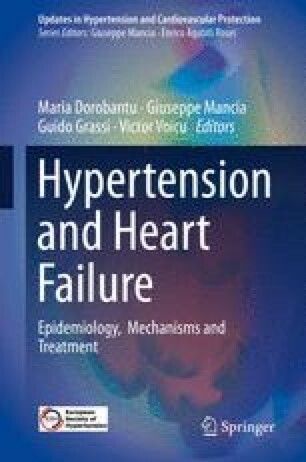 A few important and relevant aspects revealed during a series of basic and clinical research studies have changed the view on hypertension, its treatment, and the prophylaxis of its complications, in particular heart failure. It has been observed that heart failure prevalence is on the rise, with high mortality rates, including in those undergoing complex therapy for hypertension. Moreover, recent clinical trials have reached surprising conclusions, lowering the threshold for blood pressure readings that have been a reference point to guide hypertension treatment, thus far. Furthermore, it has been noted that despite the various possibilities to counteract the renin-angiotensin-aldosterone system effects through angiotensin-converting enzyme inhibitors (ACEIs) and angiotensin receptor blockers (ARBs), these agents do not have the expected efficacy on aldosterone secretion. On the contrary, the endogenous secretion of aldosterone increases under treatment with angiotensin-converting enzyme inhibitors or angiotensin receptor blockers, giving rise to new challenges. The relatively new focus on efficiently counteracting the cardiovascular effects of aldosterone is based on the fundamental discoveries from the past decades. Regardless of aldosterone serum levels (normal or high), aldosterone antagonists are essential agents in the treatment of hypertension, irrespective of the association with heart failure (HF). Moreover, the aldosterone escape phenomenon, meaning the increase in aldosterone secretion sometime after initiating treatment with ACEIs or ARBs, has been also observed after treatment with mineralocorticoid receptor antagonists (MRAs). Consequently, a need to introduce selective inhibitors of aldosterone synthase in the treatment of hypertension was obviated. These agents would prevent both cortisol synthesis inhibition and the increase in the synthesis of particular enzymes that control cortisol secretion. Currently, there is compelling evidence such a compound can be produced and validated in clinical practice. Thus, the 2016 ESC guidelines for diagnosis and treatment of HF mentioned the role of the angiotensin receptor-neprilysin inhibitor (ARNI) where ACEIs/ARBs are not efficient or not well tolerated.